Site Visit Days 11-12 (Thursday-Friday) -- Relaxed Thursday. Highlight was morning move from Jupiter Hotel to La Source Guest House, an inexpensive ($25/day) pension off Gambia Street, in Meskal Flower district, a few kilometers from LeAlem. Several EHN beneficiary patients treated on Thursday, with illness ranging from ear infection (follow-up exam and irrigation), psychiatric treatment, to hypertension. Several Thursday-Friday case study pix below. Arose early Friday. Productive, but mildly exhausting day. Pension breakfast, followed by macchiato at Kazanchez plaza, near LeAlem. 35 cent macchiatos are stunning, tasty. This trends from birth of coffee in Ethiopia and five-year Italian occupation during Mussolini reign. Fairly busy beneficiary intake Friday, about 15 total. Mid-morning travel with Dr. Aleymayehu to St. Yared Hospital near Bole to meet its director, Dr. Akeza Teame. 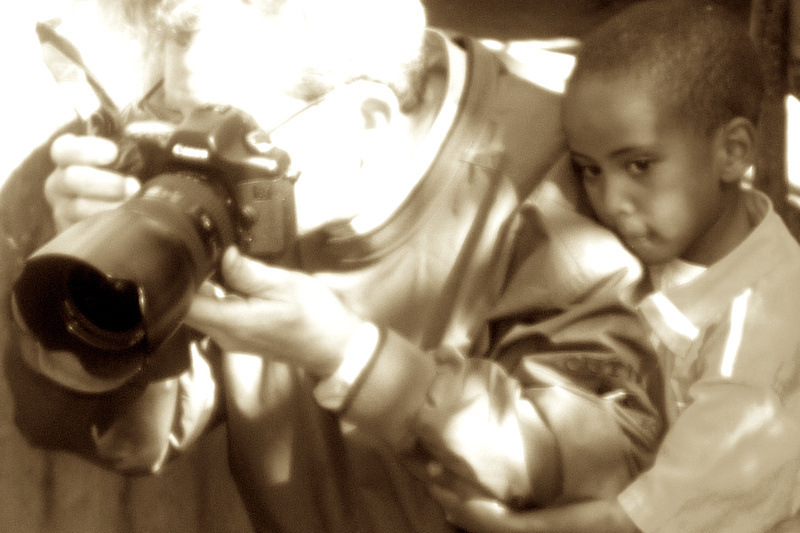 We visited St. Yared in 2007, when it was a Higher Clinic. I was interested to learn about St. Yared's evolution to hospital status, which entails an increase in facility size, patient volume, and broadening of departments. Expanding LeAlem to a hospital is a long-term option Alemayehu is considering. Our visit found St. Yared a very impressive facility, with 4-bay emergency department, CAT scan, ICU, NICU, two inpatient floors and much more, in a 6-story building. Unfortunately, St. Yared is underutilized and expensive. 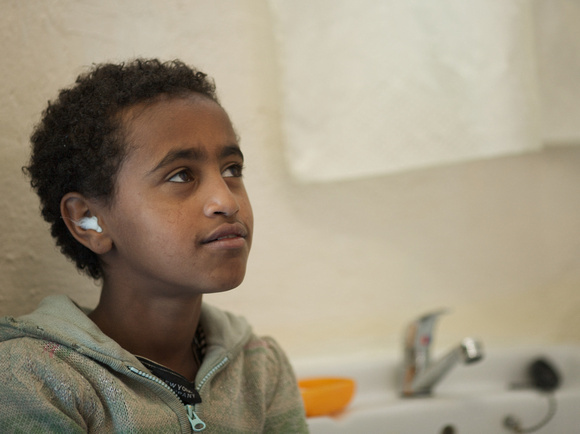 In its first year of operation, 2008, St. Yared treated 5,000 patients. 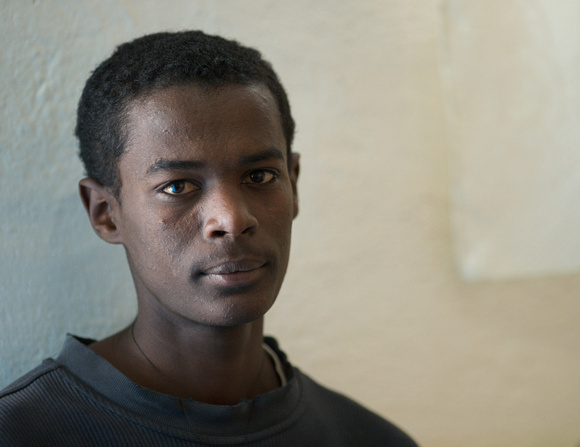 By comparison, in 2008 LeAlem treated about 15,000 patients, although LeAlem is about 10% the size of St. Yared. I reconnected with a doctor who I'd met at St. Yared HC in 2007 and Alemayehu connected with the director and doctors he knew on staff. While mixing EHN's beneficial care model with St. Yared's high-cost model may not make sense, we did establish that St. Yared could be a partner for rotation of medical students and residents from George Washington and other schools. The hospital currently has student rotation programs with New York's Albert Einstein Medical School and University of Kansas. My thought is, for the longer term, EHN/LeAlem might collaborate with St. Yared to provide an Africa community health internship or residency opportunity. After St. Yared, I lunched with Organization for Social Services for AIDS (OSSA) Addis Ababa manager Paulos Kenea. I'm interested in partnering with OSSA. 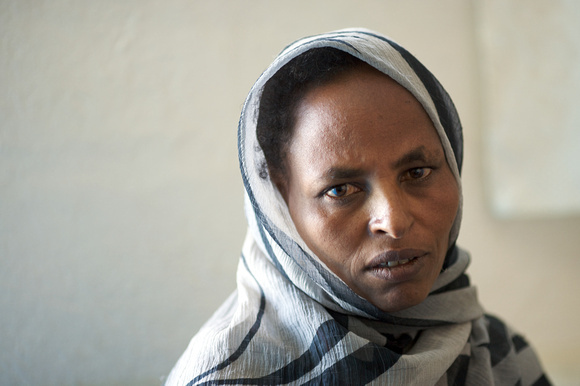 OSSA has HIV/AIDS operations in 11 of 12 Ethiopia regions, including multiple locations in the capital. Broadly stated, EHN's mission is to provide healthcare where there is none. 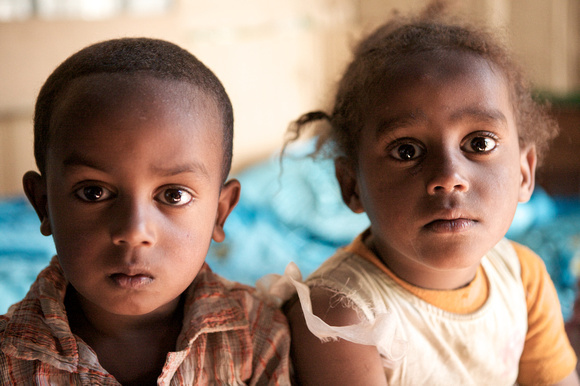 Our program with LeAlem in Addis focuses on indigent women and children. As this is successful, we anticipate moving to establish needed healthcare in additional Addis locations and in rural areas, where there is no healthcare. 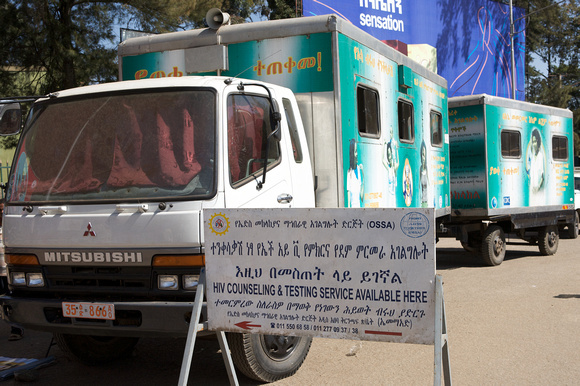 Partnering with OSSA, which reaches into rural areas through its HIV Voluntary Counseling and Testing (VCT) programs (mobile unit pictured above), may prove an efficient vector for EHN. Along these lines, after lunch, Paulos and I toured OSSA's VCT, palliative care and HIV/AIDS support facility inside Merkato, the sprawling marketplace (Africa's largest) at the heart of Addis. The facility is a fixed compound, a building with reception and about 12 patient rooms, and several outbuildings. A concept is that LeAlem could rotate doctors through the OSSA Merkato facility, meeting indigent persons' healthcare needs, expanding EHN's program (without incurring huge overhead). This partnership and care delivery model might be replicated in rural areas. Correspondingly, OSSA is interested in EHN support -- advocacy, at minimum -- for a nutrition program. OSSA patients, many of whom are on anti-retroviral therapy (ART), most often fail due to nutritional insufficiency. ART drugs need to be taken with food. Two OSSA ART children died last quarter due to poor nutrition; pediatrics on ART with good nutrition typically thrive. 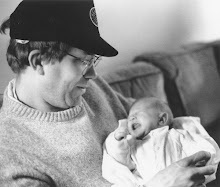 (HIV-positive twins, under OSSA care, are pictured above.) In response to a site visit interrogatory, Dr. Alemayehu identified nutrition as the most important collateral issue impacting the success of LeAlem beneficiary care. On receiving a nutritional support grant (funding) request from Paulos, I told him that EHN's mission is focused on the current healthcare model, but that I would work to identify patrons and support to answer his request. I suspect that $100,000 per year is required to provide nutritional support for the 5,500+ households under OSSA care. Perhaps this is something to consider with the Clinton or another foundation. Having dinner tonight with a referral partner from large Addis evangelical church. Partner is interested in EHN funding a dental clinic. Clearly this is an unmet need; dental hygiene is noticeably poor in the indigent population. My concern, however, is whether providing dental care is the best use for EHN resources and our intent to provide the highest-value, most beneficial healthcare for patients. I'll present our partner's suggestion to EHN's board for review. While in Addis for two weeks, my (volunteer) job has been to conduct a formative review of LeAlem performance under EHN grant, develop case studies (including pictures) of beneficiary patients, and meet with current and prospective EHN partners. The subject matter is extraordinary, at times heart-rending. It is in situ -- and sometimes on-the-fly -- public policy and program development, made vital by the context, our proven results at LeAlem, and opportunities to make a bigger difference. As a going-in product, I developed a 29-page site visit plan, with introduction, conceputal framework, interrogatories, data collection tools, resources and such. My evolving product, which I hope to finalize by February 28, will be a report presenting findings, recommendations, anecdotal case studies, and additional material. EHN will use the report to shape program direction; produce material for media, fundraising and extramural support; report to donors, and for similar purposes. Tomorrow, Saturday, I'll spend the morning at LeAlem in wrap-up mode, followed by a party at social worker Almaz's house. Sunday, I'll probably take a last long walk in central Addis, perhaps visit a museum and hit a few shops. Then, it's the airport at 7 PM, fly home, arriving at Dulles Monday mid-morning. These efforts to provide health care to the people of Ethiopia is something that we should all commend. I just hope more developed countries extend their help to Ethiopia. I understand that they still have a very terrible health care condition.